Today, we’re looking at Fire. Mistheads don’t like Fire. While I love Frostbite and Poison, I’ve just never gotten into Fire with all its over-times. I’m not sure why. I probably knew at some point, but I forgot. Mistheads are like that. Remembering reasons is overrated. Some of the Fire pets look really cute though! ANYWAY, for this article I can luckily count on the help of Jeremy RavenHunter to point out inaccuracies. This article is based on the data I’ve painstakingly collected in November and December of 2017. I collected screenshots of the pets of a total on 307 overlords. However, when divided per school, the data is too limited to draw wide conclusions about the subject. 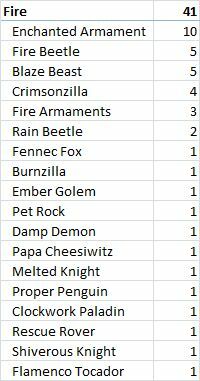 Where the data isn’t complete, I will add my own (or Jeremy’s) pet suggestions. No matter what school we’re looking at, you can expect the Enchanted Armament to be in the top three. 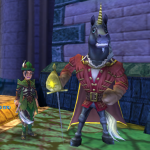 For Fire, the Enchanted Armament is the most popular pet I found. Out of 41 Fire overlords, 10 chose an Enchanted Armament as their pet. 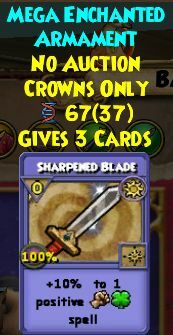 No doubt its three sharpened blade cards are very useful when blade stacking. These 10 overlords were 6 Champions, 2 Maguses (Magi? ), 1 Grandmaster and 1 Legendary. 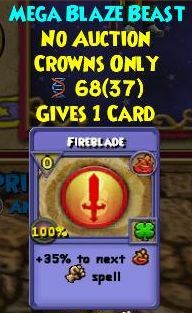 Why is an Enchanted Armament a Good Pet for Fire? I’ve said it before and I’ll say it again: this is a good pets for most schools. This pet is great if you like setting up for a big attack and killing your opponent in one hit. It’s especially useful to those lower levels who don’t have learned the spell yet. 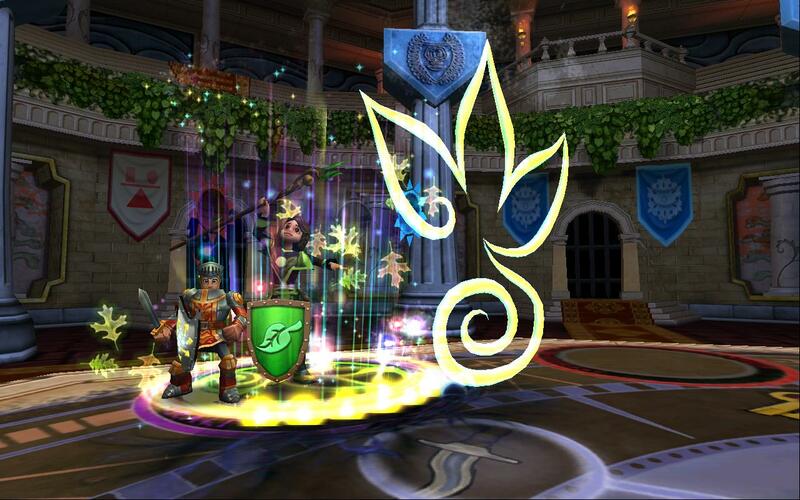 The six Champions with this pet prove, however, that this pet is still useful even after that. If damage is what you’re after, this pet can be useful for you. I ran into five Fire overlords with a Fire Beetle. I didn’t actually run INTO them though, I stopped before I hit them. Of thee five, three were Legendaries and two were Champions. I also found two Fire overlords with a Rain Beetle. 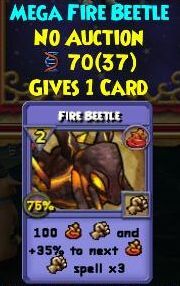 Why is the Fire/Rain Beetle a Good Pet for Fire? Both of these are excellent shield breakers. The Fire beetle does fire damage and puts three traps on the opponent, while the Rain Beetle does Storm damage and puts a blade on the caster. Both of these are very nice as part of a combo attack. You will only get one card from the Fire Beetle, while the Rain Beetle will give you four cards at Mega. I’m grouping the Blaze Beast together with the Crimsonzilla here, because they give the same exact card. Five Fire overlords were using a Blaze Beast. Three of those were Legendary wizards, one was an Exalted and one a Champion. Another four Fire overlords were using a Crimsonzilla pet. Two of those belonged to Initiate wizards, one to a Journeyman and one to a Legendary wizard. Why is the Blaze Beast / Crimsonzilla a Good Pet for Fire? Three Fire Armaments found their way into my data, as the pets of one Grandmaster, one Archmage and one Exalted Fire overlord. 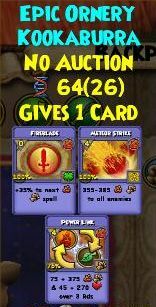 Why are Fire Armaments a Good Pet for Fire? This pet gives three item cards. First, a cloak, to leave your opponent questioning what spell you just cast — a Weakness or an Infection? A dispel of which school? Stun Blocks or a set shield? Second, a Power Link, which is a little bit more powerful than the trained version. And third, a Furnace aura, which increases your Fire damage by 25%. I found one Initiate overlord using a Burnzilla pet. Why is the Burnzilla Pet Good for Fire? 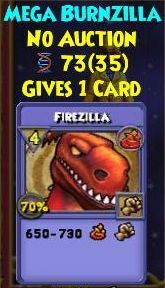 The Firezilla item card this pet gives has the same damage as the TC version of it. The pet unfortunately only gives one card. I’d prefer a pet with a blade over this, but Firezilla is a cool spell. There was also one Journeyman Fire overlord running around with a Fennec Fox pet. This pet gives three cards: a Fireblade, a Fuel trap and a Fire Elemental minion. Why is the Fennec Fox a Good Pet for Fire? 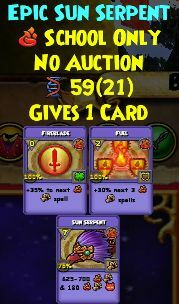 The first two spells that this pet gives, the Fireblade and the Fuel trap, are good for any level PvP’er. The Fire Elemental minion is more useful at low level. It seems especially good for overlords that want to do low level PvP, before you train the minion spell at level 28. None of my overlords used this pet, but it’s one that could be useful nevertheless. It gives three cards: a Fireblade, a Fuel trap and a Sun Serpent item card. Why is the Sun Serpent a Good Pet for Fire? Just like the Fennec fox, this pet’s first two cards can be handy for Fires at any level. The Sun Serpent item card is more situational. It does less damage than the trained spell, but also costs only 7 pips instead of 10. That makes it much more useable for lower levels. This attack can also help kill minions. For low level PvP, there’s another contender I quite like: the Ornery Kookaburra. 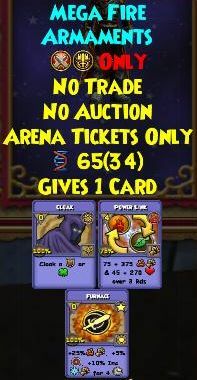 This hybrid pet comes with three cards: a Fireblade, a Meteor and a Power Link item card. Why is the Ornery Kookaburra a Good Pet for Fire? If you’re too low level to train Meteor (lvl 22) and/or Power Link (lvl 55), this pet offers some options. I wouldn’t say this is the best pet ever, but if you compare it to pets that only offer a blade, it’s nice. There are of course other pets, like the Proper Penguin one of the Fires I encountered was using. As for other schools as well, the Polar Fox and Party Corgi can be good, with the one blade they give. However, there are better alternatives mentioned above. 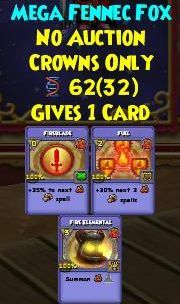 Do you know of another good Fire pet?